Our masala chai organic tea bags consist of a warming blend of black tea, herbs, spices and no added flavouring. Enjoy the taste of a traditional blend of 'masala chai' (otherwise known as 'spiced tea') in the comfort of your own home. Our masala chai tea bags are ideal if you're looking for an authentic rich tasting cup with cloves, cinnamon and whole aniseed. The rich, spicy taste makes this blend ideal for those cool mornings and cosy evenings, especially by a fire or with your favourite book. Our masala chai tea bags contain black tea, cinnamon, ginger bits, fennel, whole aniseed and cloves. In India, chai is served by street vendors and train vendors called chai wallahs using many of the listed ingredients in our blend. 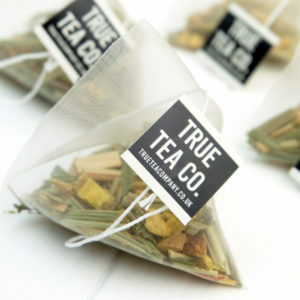 Each biodegradable tea bag contains 2 grams of our chai blend, the 'golden ratio' amount for an 8oz cup of tea. Add milk if desired. Using milk is the typical way to serve chai in India!